The University of Western Australia (UWA) is happy to announce the launch of ‘PURSUE IMPOSSIBLE, the 6th UWA Grand Art Challenge. And there is a booklet that comes via the menu if you click “info”. To see “a color” is an imagination as two humans even standing next to each other will never see the same. Blue is the ultimate color and Ua Blue is the ultimate Blue. International Klein Blue (IKB) was a milestone in art. 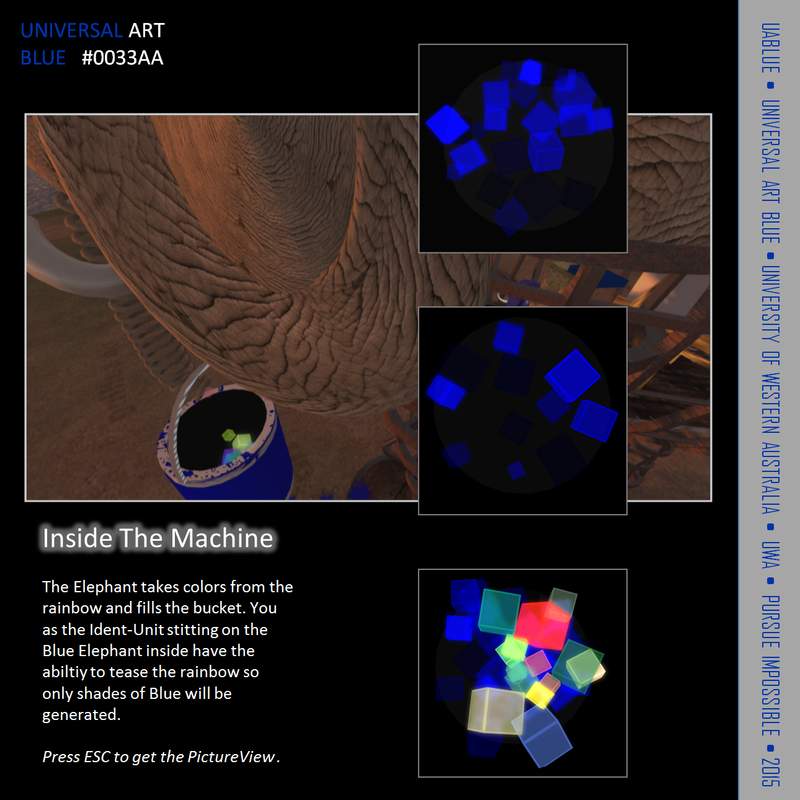 Now Ua Blue in a virtual realm steps in and gives a machine control to find the “only one”. When the MONDRIAN 3D cube generator has detected that a cube made in Ua Blue was rezzed it shows the Avatar the end of our struggle – the end of The Battle of Colors. No windlight will have an effect on the detector. Click the generator as described by the menue to create a piece of unique art that only you will have. Never two pieces are ever the same. The installment is free of rights of third parties. All content is set under MIT open license. Just the creator UABlue has to be credited on all transformations. Prof. Herbert W. Franke for the creating the first interactive art machine named MONDRIAN on a Texas Instruments Copmuter TI 99/4 in 1979. This machine creates rectangles in 2D driven by computer steered randomness and influences of the user. Konrad Kunze for implementing MONDRIAN in Windows in a 3D version based on the design of MONDRIAN 1979. 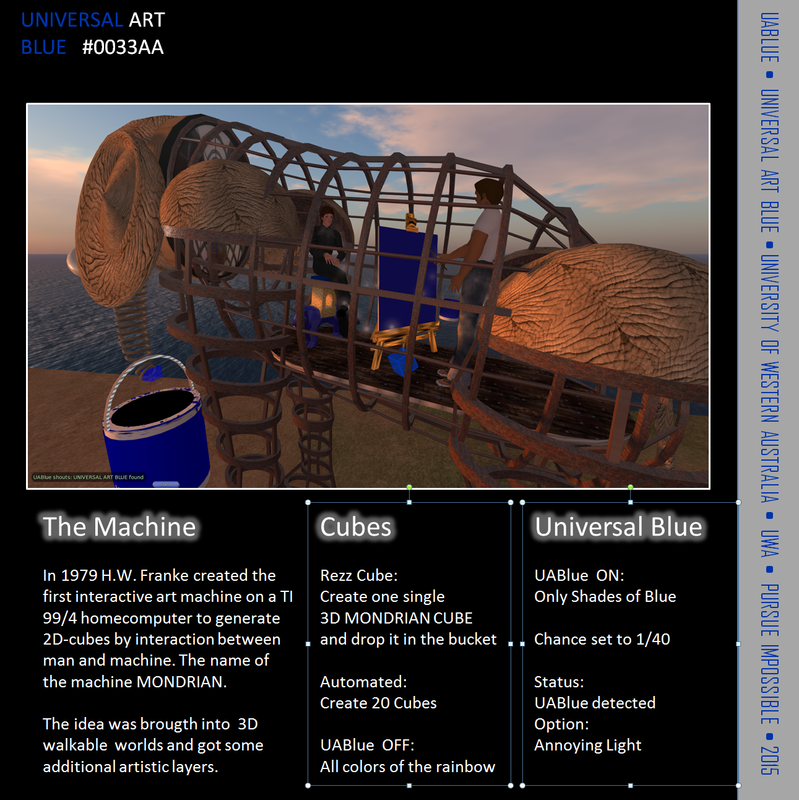 Qnav What aka Daniel Jung and Art Eames for re-programming MONDRIAN 3D in Linden Scripting Language. Exy Atreides aka Sean Lennon for building the mesh Elephant as a team project. Minimal Blue for developing the concepts of Programmed Minimal Art in the late 70s which lead me now to the search for the Ultimate Blue using a 3D walkable environment. The chance to get UABlue are set on 1/40 to avoid that the user gets tired and has to try over hours to see a creation of this color happen. In the future the separation of Ident-Units, call them contributors, makers, humans, persons, bots, avatars or as you like, will become a fiction. Read The Artefact to understand the word “I bring brains to the Depth. Forever”. UABlue is one person made by four and nevertheless a true single entity. 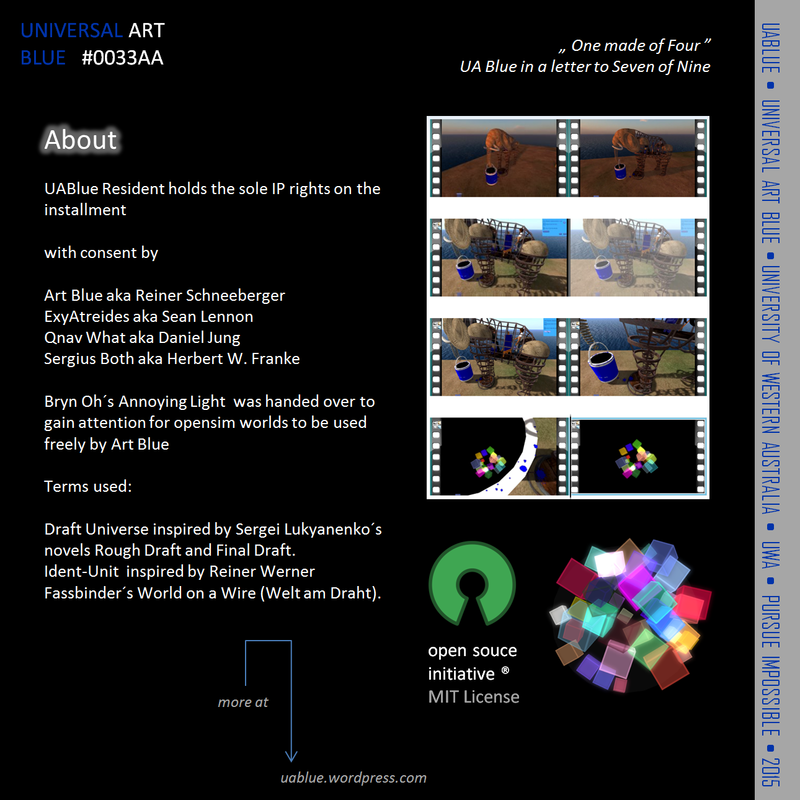 Hereby Art Blue claims the color UNIVERSAL ART BLUE. UABLUE is common known as ‘Ua Blue’ a shade of Blue that is 100% saturated and 67% bright. For reference purposes, Ua Blue has the hex value #0033AA. But of course the use of the color Hex #0033AA stays free for everyone. 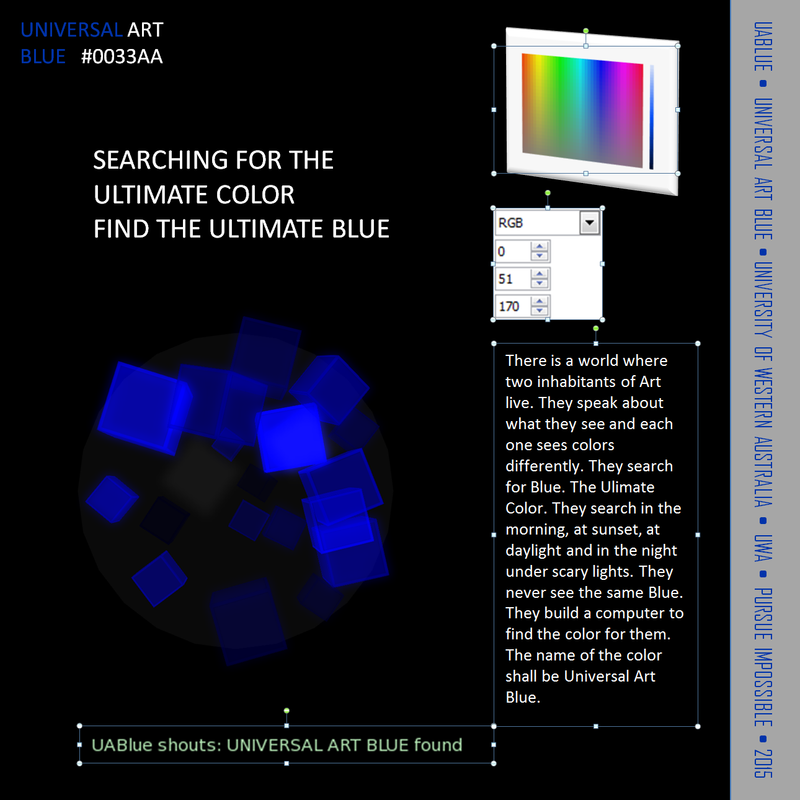 The concept of UABLUE is Universal Blue. So all SHADES of BLUE are claimed to be applied in random order around the oscilator UABLUE. In 1978 Art Blue aka Reiner Schneeberger set up and published a universal random generator, one with sequence repetition and one without. His generator, named SNERND, was used for plotter drawings on paper. Some of these old works are now in museums [MoMa, Whitney Gallery, Smithsonian, Kunsthalle Bremen]. 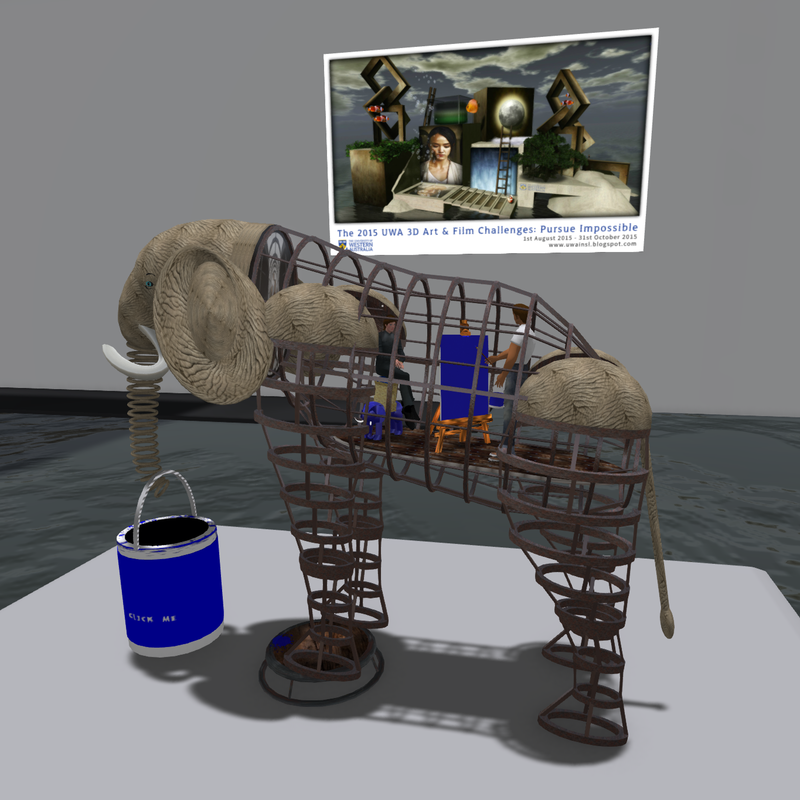 The Immersiva Foundation – Stiftung Kunstinformatik – supports the field of Digital Art in virtual immersive realms by supporting artist to contribute to the Santorini Bieniale. In 2015 Art Blue finished the conservation of the first 3D prim and sculpt art period by selecting 64 artists. Everything is published in articles, books. 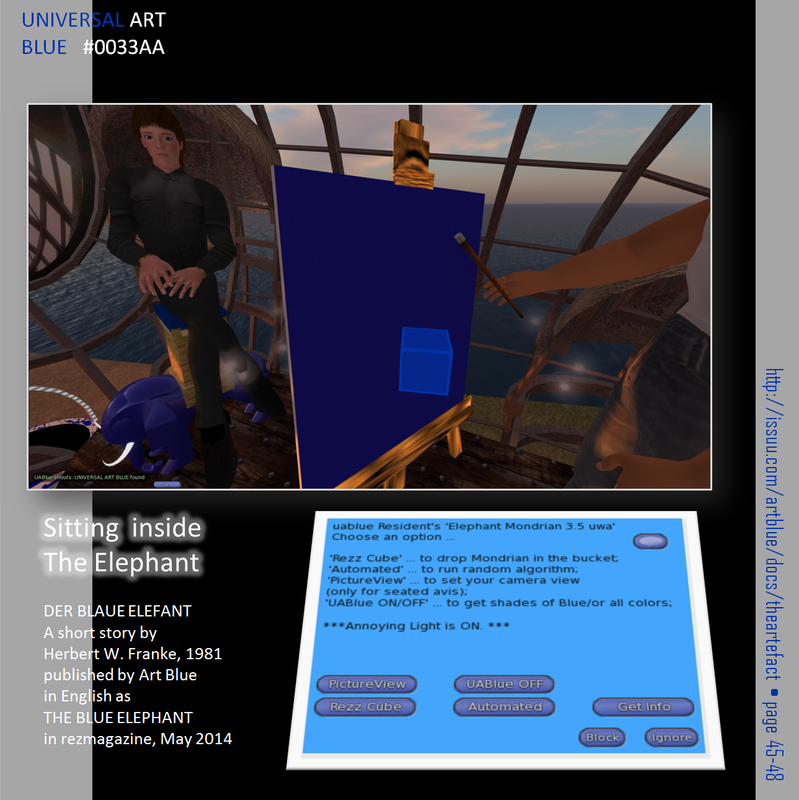 Since January 2014 Art Blue writes monthly in rezmagazine.com where you get a fine follow up in Digital Art by looking back. Maybe you start with LPM 2015 in Rome and then you Google backward in time? Saying this UABLUE will bring “color” to a new range of recognition. The very first experiments will begin soon in virtual realms. “Blue” by group Zero facinated me since school days in the late 70s. In 1989 I set up the first universal color code table for digital screens – after I met Friedensreich Hundertwasser in New Zealand speaking about “gold tones”. So blue and gold became my prefered colors in my works after 1990. 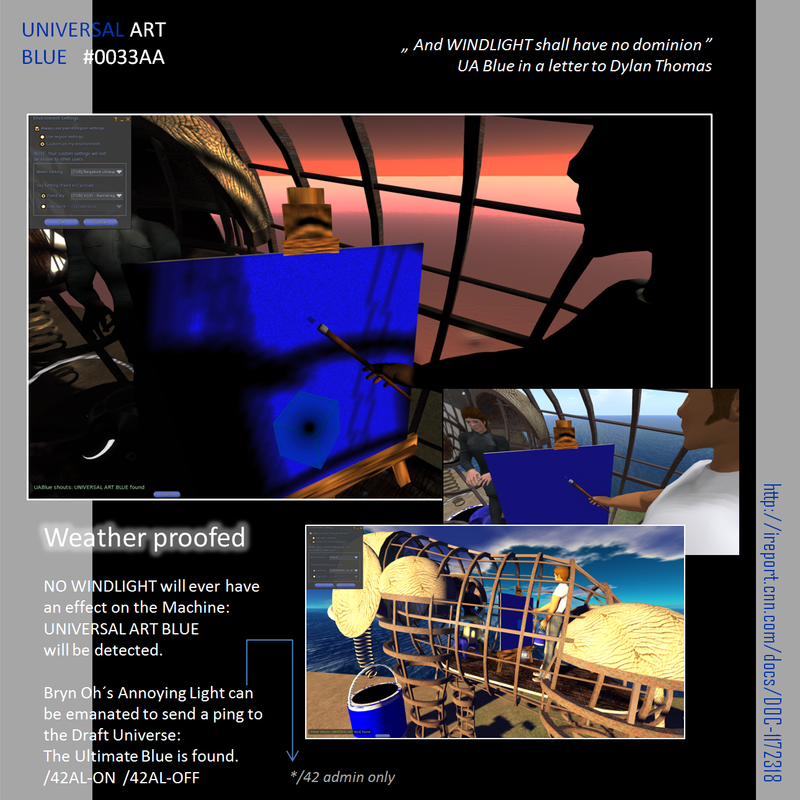 Universal Blue [and Universal Gold, which I will claim soon …] gets a new meaning now as in virtual worlds it is all about windlight. There is not the color an arists had in mind when creating a work. The artist needs to control the world of the visitor. No environment control no art – so simple.